Pioneers, risk takers, brave, fighters. These are some of the words that have been used to describe Verdun Burgess and Sue Edwards the founders of Black Ridge, the southernmost vineyard and winery in the world. In 1980, having bought a block of land in Conroys Gully that had been part of the original Earnscleugh Station and a centre of gold mining in the 1860’s, they were confronted with a harsh dry and rocky landscape in an area that had been dismissed as being unsuitable for grapes. (Though there had been some success nearby by Ferraud in Victorian times, forgotten and only later rediscovered) After running through and eliminating a number of possibilities they chose to try grape growing, possibly due to the emergence of Marlborough as a great grape growing province in the 1970s. Baking hot summers, hard frosts and snow in winter, lack of water and the need to carve out the vineyard from the local schist rock with bulldozer and dynamite took their toll. On planting the vines rabbits, a major pest since their introduction from Europe in 1870, caused the loss of young vines more than once and finally when a crop emerged, birds and wasps here waiting to share the bounty. So began an epic battle against their own inexperience, nature, extreme weather and the landscape with very little technical or financial support as there was little recent history of growing vines locally. A decision to grow varieties found in the same latitude in the northern hemisphere was wise. Pinot Noir, Gewurztraminer, Riesling and Chardonnay were chosen with a stab at Cabernet Sauvignon and Merlot. After many years of learning, experimenting and above all perseverance Black Ridge had its first proper harvest in 1985 and first vintage in 1988. Making its vines some of the oldest in the region, yielding wines with the true terroir of the district. 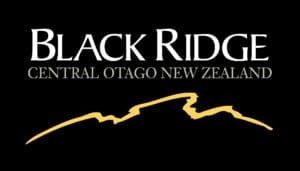 A winery was established in 1992 and since then Black Ridge has become an icon of Central Otago wine production.